Conservation of genetic resources is essential, both to ensure that professional breeders continue to have access to the genes and gene complexes needed for current and future crop improvement and to enable farmers to continue to select and modify their crops in response to changing environments and circumstances. Plant breeders very effectively used genetic resources, coupled with higher levels of inputs, to meet the demands of food shortages in the 1960s and 1970s. The result was the Green Revolution. However, the lessons learned from that period have contributed to the current emphasis on long-term sustainability of production systems and the protection of the natural resource base, while at the same time maintaining an adequate and healthy food supply. This places new demands on plant breeders to continue to increase productivity in socially and environmentally appropriate ways. Plant breeders will respond to that demand; biodiversity is the means for achieving their goals. Potentially valuable genes and gene combinations, which might at present be unknown or undiscovered, can provide the means to fewer external inputs in crop production systems, lower levels of environmentally toxic pesticides, and internal resilience of agroecosystems. Conserving these needed genetic resources for future use in the face of technical and political obstacles can be an enormous challenge. The number of higher plant species is estimated to be between 300,000 and 500,000, of which approximately 250,000 have so far been identified (Wilson, 1988; Heywood, 1995). Of these, about 30,000 are edible and an estimated 7000 have been cultivated or collected by humans for food (Wilson, 1992). Despite this, the crops that "feed the world," by providing 95% of dietary energy or protein, number only 30 (McNeely and Wachtel, 1988). Just three of them — rice, wheat, and maize — account for almost 60% of the plant-derived calories in the human diet. Much of the genetic diversity of major tropical food crops is now believed to be reasonably secure in gene banks, especially of those species having orthodox seeds such as rice, wheat, sorghum, and maize. For some crops, which require conserving bulky vegetative organs or living tissues other than seeds, there are often fewer accessions maintained. Cassava is a crop of world importance, but there are only 23,000 accessions; and yam (Dioscorea spp. ), an important staple crop in Africa, is represented by only 11,500 accessions. There are still specific gaps in collections even for crops which are well represented. For example, there are over 300,000 accessions of rice in storage, but there is still need for conservation of O. sativa from Madagascar, Mozambique, South Asia, and Southeast Asia (FAO, 1996). The situation is greatly different for most minor crops and those species that are vegetatively propagated or produce seeds that cannot easily be stored for extended periods at subzero temperatures. Crops such as taro (Colocasia esculenta), yams, rice beans (Vigna umbellata), and breadfruit form part of the staple diet of millions of the world poor, yet relatively little work has been done either to conserve or improve them. In addition, there are many underutilized species of vegetables, fruits, and other species, including nondomesticated plants, which contribute to nutrition and dietary diversification in millions of tropical households. These species often have been largely ignored because they are of little commercial value or because they are at little risk of being lost. The result is that very little is known of the diversity, distribution, and characteristics of such species and so conservation and maintenance efforts are minimal. The situation for minor and underutilized species could be improved in the future, as some gene banks have agreed to accept regional responsibility for long-term ex situ storage of some minor crops. The National Bureau of Plant Genetic Resources in India has, for example, accepted responsibility for rice bean, moth bean (V aconitifolia), okra (Abelmoschus esculentus), and amaranth (Amaranthus spp. ), and the Institute of Plant Breeding in the Philippines has accepted responsibility for winged beans (FAO, 1996). Because of the gaps in collections of both major and minor crops, the added factor of genetic erosion increases the urgency to conserve diversity. The diversity can be immense within the relatively small number of plant species which supply most of the world energy and protein. For example, the International Rice Research Institute gene bank contains about 80,000 accessions of rice. But much of the rice diversity may already have been lost from farmers' fields and may now only exist in gene banks. By 1982, the rice variety IR36 was grown on about 11 million ha in Asia and had replaced many local varieties (Plucknett et al., 1987). Although there are varied reasons for the loss of genetic diversity, there is widespread agreement that one major reason is replacement of local crop varieties by new cultivars. At present, few quantitative data exist to define the extent and rate of genetic erosion of crops and their wild relatives (Ceccarelli et al., 1992). Farmers in traditional systems will routinely and intentionally discard components of local crop varieties as a normal part of their management practices (Wood and Lenné, 1997). • Policy legislation (for example, until recently the cultivation of farm landraces was discouraged in Europe). Regardless of the reasons for disappearance of local crop varieties and their wild relatives, the need to conserve that germplasm must be considered in conservation strategies. for many export crops and commodities concentrated in a small number of countries. For example, Zaire maintains over 80% of the global oil palm accessions. It is critical that more attention be given to managing these collections, to safety duplication, and to establishing new collections, especially in areas of diversity. In addition, some tropical countries need to consolidate national collections to comply with the Convention on Biological Diversity, which emphasizes in-country conservation of indigenous genetic resources, both in situ and ex situ. Many tropical and subtropical countries report problems in maintaining collections because of the lack of suitable drying facilities and unreliable electricity supplies (FAO, 1996). This situation is particularly serious in coastal regions having 60 to 90% relative humidity. Further constraints to conservation in the majority of developing countries are the lack of adequate human and financial resources and infrastructure. Overall, the efforts to conserve the most important world agrobiodiversity are impressive and commendable. However, as noted above, there is still much to be done and many questions to be answered about the most effective and efficient conservation strategies. 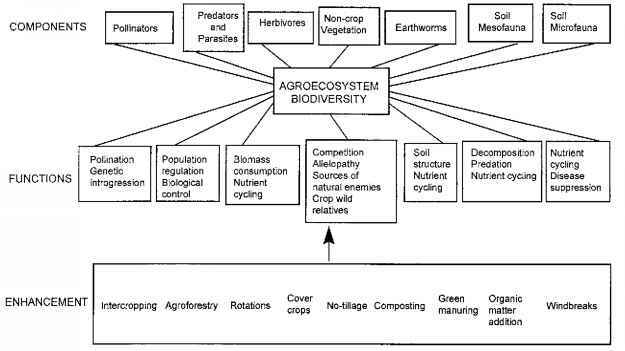 The need exists, as well, to ensure that agrobiodiversity is not just conserved but also fully utilized to serve agroecosystem needs.